Check out these before and after pictures of our duct cleaning services! 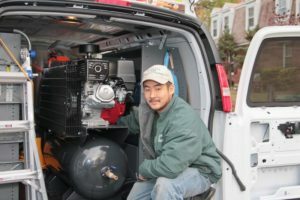 Quality Air Solutions provides households in Potomac, MD and the Montgomery County area with professional duct cleaning, dryer vent cleaning, bathroom vent cleaning, and air monitoring. Contact us today if you feel the air in your home needs improvement. Worried About the Debris Build Up in Your Ducts in Your Silver Spring Home? 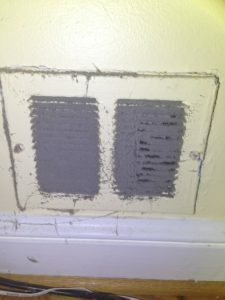 “The Quality Air Solutions team did an amazing job cleaning our air ducts and dryer vent. They were very knowledgeable, organized, and took the time to explain the process and show me before and after pictures. Our older home had 70+ years of filth that they removed from our ducts, and we now have peace of mind that our family is breathing in cleaner air. Would highly recommend and will use them again!” – B.T. in Silver Spring, MD When was the last time the ducts in your home were cleaned? Contact Quality Air Solutions today! A Clogged Dryer Vent is a Fire Hazard! Clogged dryer vents are a fire hazard! Safeguard your home by routinely cleaning your dryer vent from lint build up. Contact Quality Air Solutions today for your duct and vent cleaning in Laurel, MD! How do you know your ducts need cleaning? In Potomac, MD, our team looked at a clogged return vent cover. You can see the pile up of debris beginning to come out of the vent. Duct cleaning is important to prevent air pollution in your home. Contact Quality Air Solutions today!